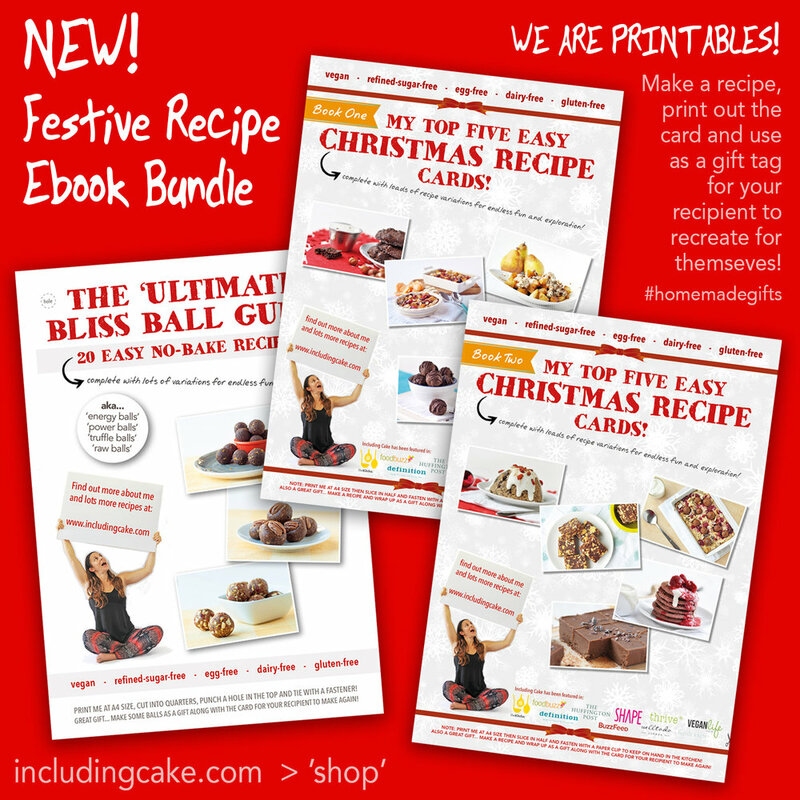 you can make your own plain cheesecake base or if you are pushed for time buy a plain one and focus on making the bliss balls decorations. you can make it any flavour you fancy - I went for gingerbread but any festive theme (or non-festive) would be awesome. You can make the topping ahead of time and then decorate your cheesecake last minute for a super speedy show-stopping dessert. Below, I have provided the cheesecake recipe I used if you want to try it, but as I mention above the main focus of this post is on the decorations, so you could literally use any plain smooth topped cheesecake base you like. I developed the ‘baubles’ for a brand so I don’t think I showcase them on my blog at the time - but the concept is simple. Toss desiccated coconut in a little turmeric, greens powder and beetroot powder and roll the balls in it to get a pretty multi-coloured batch! Add the base ingredients to a food processor and blitz together until quite fine and clumpy. Press firmly into the bottom of a spring form pan (lining it may also help- optional). Set aside. Add 1/2 cup water with the agar flakes to a small sauce pan. bring to a boil and then simmer for 2-3 minutes stirring occasionally. Meanwhile, blitz the remaining ingredients together in a food processor until thick and smooth (you may need to scrape down a couple of times). By this time the agar should be ready. Add this to the food processor and blitz for a further 20-30 seconds until the mixture is as smooth as it can be. Working quite quickly (because the agar will begin to set) spoon/pour the mix on top of the cheesecake base. Tap the tin gently to smooth the top and get rid of any air bubbles. Once cooler enough place the cheesecake in the fridge to fully set (an hour or so). Meanwhile, make the bliss ball topping as directed below. handful of goji berries and pumpkin seeds for additional decoration. *Remember you could use any flavour here or a mix of flavours - e.g orange, cherry bakewell, chocolate, vanilla would all work well depending on what base favour you opt for! 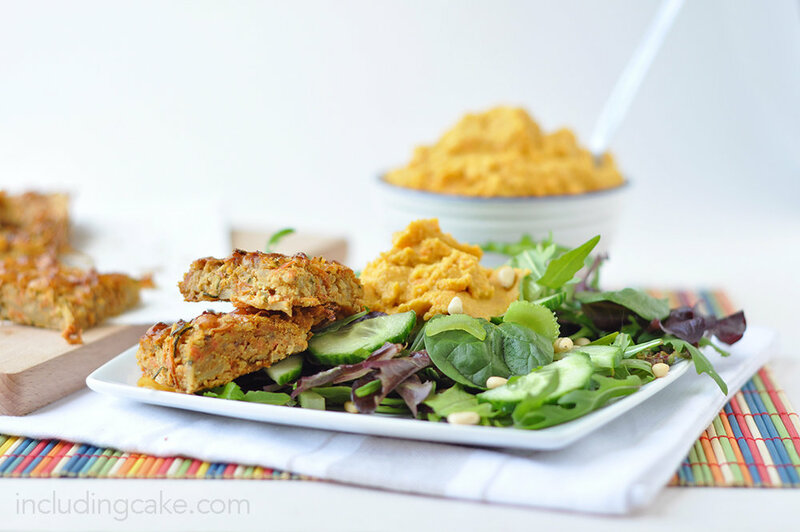 Blitz all ingredients together in a food processor. The mix should be soft and clumpy and easy to roll into balls. Using your hands, roll into balls of various (fairly small) sizes. If choosing to decorate as multi-coloured ‘baubles’ - dust a little extra desiccated coconut with turmeric, greens power and beetroot power (plus blue spirulina if you can get your hands on it!- any other colours?!) and roll the balls in it. Allow them to chill and firm up whilst the cheesecake base firms up. 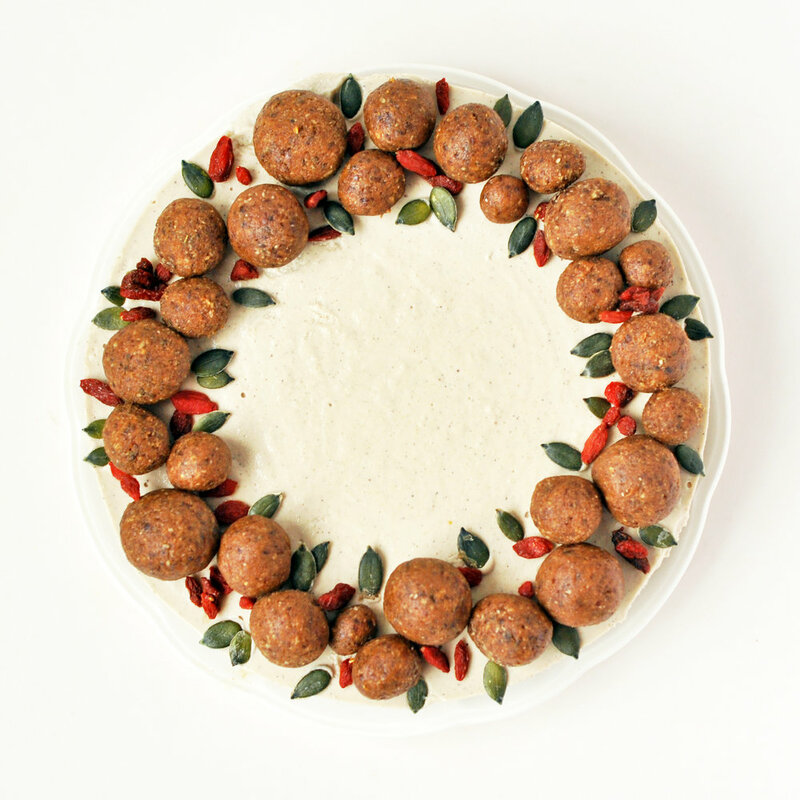 Once ready to decorate, place the balls gently in a mix of sizes around the perimeter of the cake top. Sprinkle goji berries and pumpkin seeds as desired in the gaps as ‘foliage’. NOTE: you could make these ahead of time as they will store in the fridge for a couple of weeks. They transport well too if you needed to take them elsewhere to a festive party and decorate a cake there! The entire assembled cheesecake will keep for 2-3 days in the fridge. I felt very unprepared and aware that it may not run perfectly or smoothly but that's ok. It was the spontaneity that spoke to me in the moment when I saw a post by the Ethcs crew that I really resonated with. Having spent time at Raw Fest on the last weekend of July, and more recently exploring the connection between a plant-based diet and our innate sense of creativity for my forthcoming book, I am learning that a raw vegan diet has the potential to bring you even closer to that connection with self, with source, with nature. My good friend Rhiannon Van Der Griffin recently shared her raw journey with me a part of my book research and I was inspired more than ever to try it for myself. In moments like this I come back to this quote by Matt Cutts. It's simply about getting curious to explore what becoming the very best version of you could look like. For 30 days. So how did the month play out for me? NOTE: more in depth update in this post! Well, I admit I wasn't perfect. I wasn't 100% raw. Probably about 85% in reality. One of the biggest reasons for wanting to do it, was to increase my repertoire of raw meal ideas for the future, and that I did for sure. 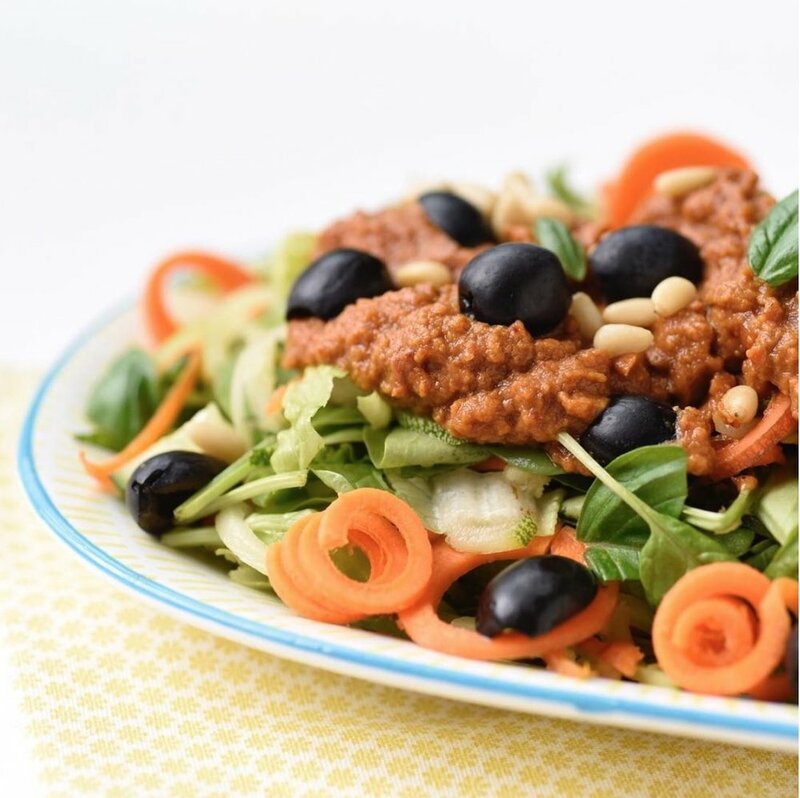 In particular, raw sauces, dips and dressings for salads can REALLY make a salad.... it doesn't often matter what veggies you have in the bowl if you have an incredible sauce to smoother them in, right? 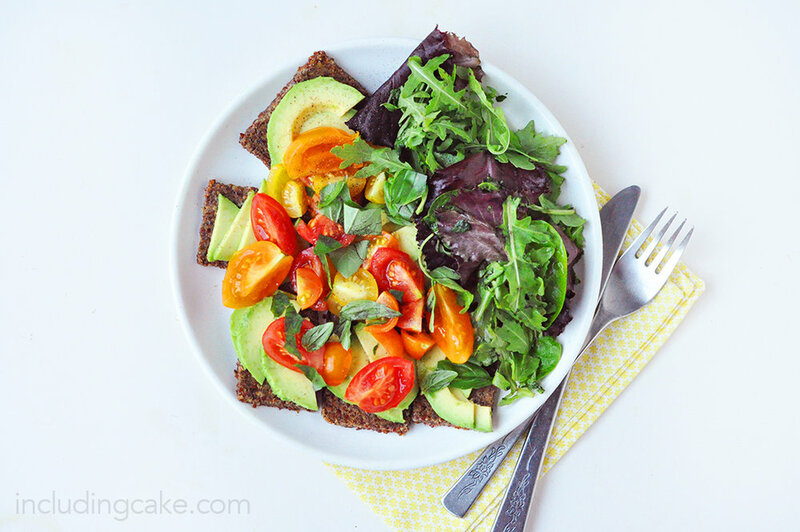 ;-) Make enough for the week and you have easy meals lunches you can make in moments. 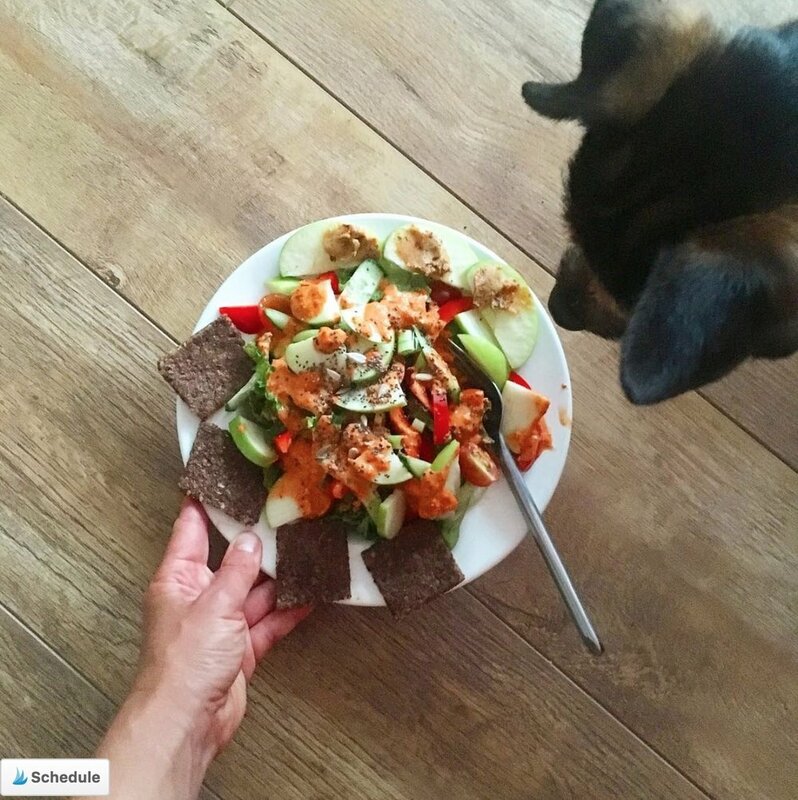 I am going to put together a separate post sharing a big roundup of raw recipes from a vegan community I am part of, but for now I'd like to share a few of my favourite discoveries and tips. Whether that might simply be incorporating a green smoothie each day, or a raw lunch Monday to Friday, or more raw snacks. It's not about hitting 100% perfect, what works for you? 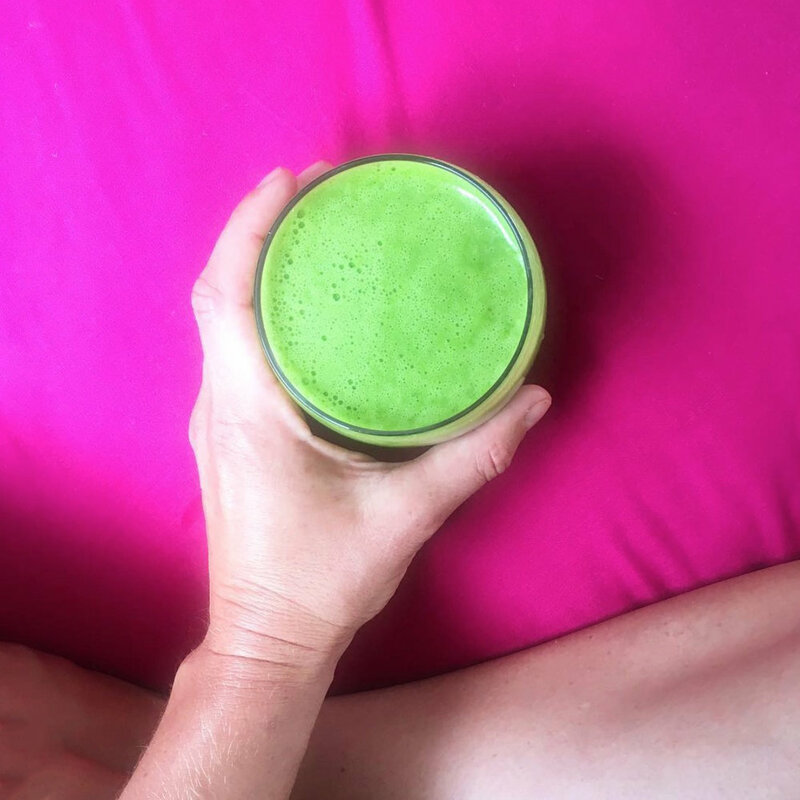 Have you felt any benefits going more 'raw'? Or what are you currently struggling with? Raw sauces etc (as noted above) - make a weeks worth. Bliss Balls are also an obvious go-to, BUT I did have a tendency to eat a lot of them and then be too full for a massive salad- ooops! Courgetti- spiralised courrgette and carrot for a fun pretty bowl. Also great with the chunky bolognaise- see pic above - recipe to come. Smoothies of all kinds - green, berry or banana and raw cacao for a chocolate hit! Overnight oats - this one is a little contentious as to whether it's actually raw, since rolled porridge oats are technically heated in the rolling process. But this was often nice to wake up to instead of smoothie or fruit bowl in the morning, or as lunch on the go. 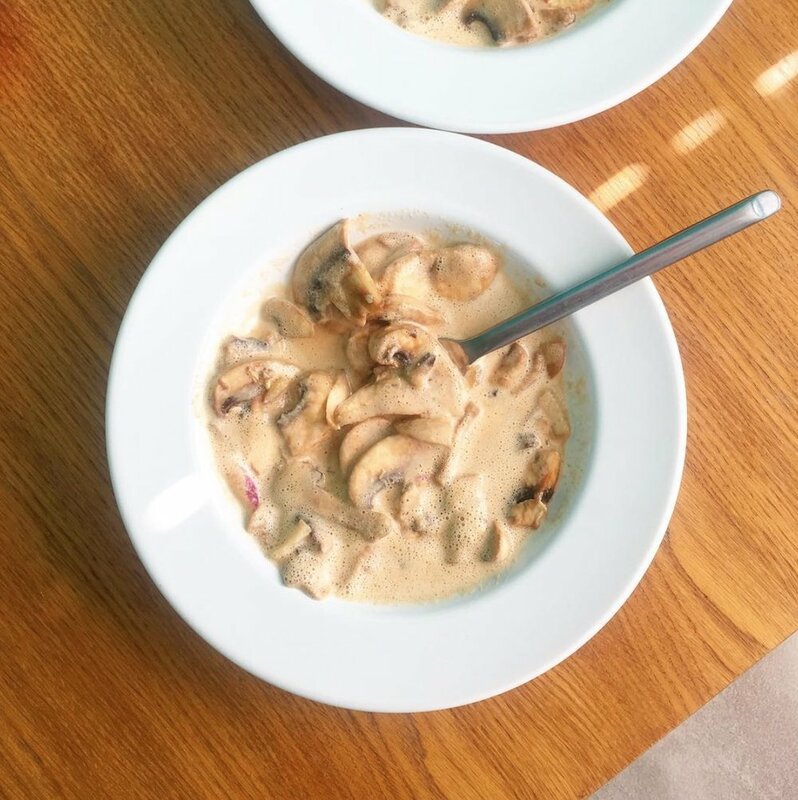 Mushroom curry - so easy and so good (see pic above) based on this recipe using cashews. 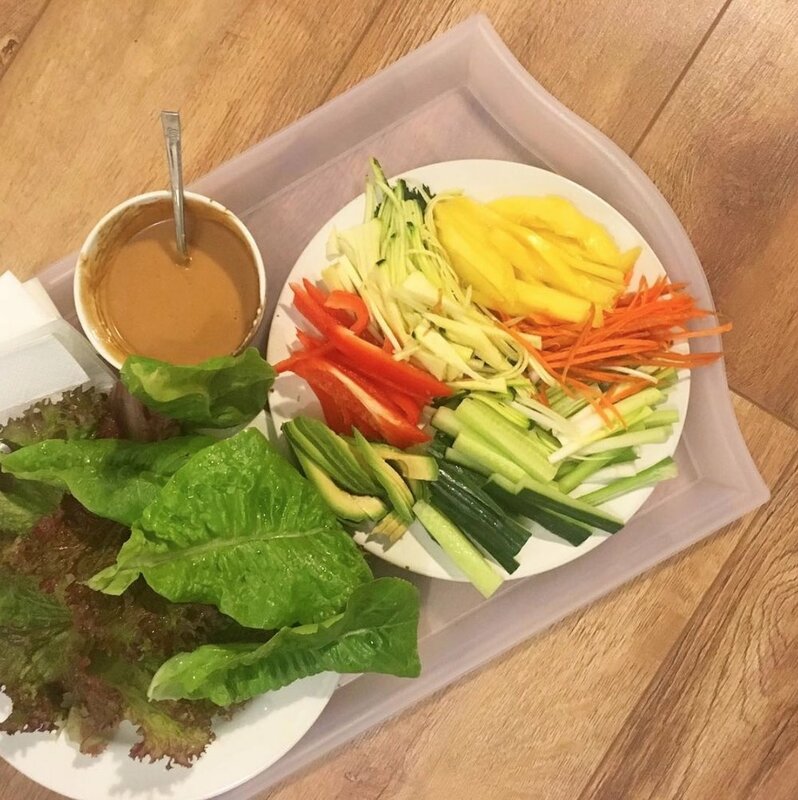 Lettuce wraps with a peanut satay dipping sauce (technical the peanut butter component wasn't raw) note: gem lettuce leaves work best- those in the picture were from my veggie patch. 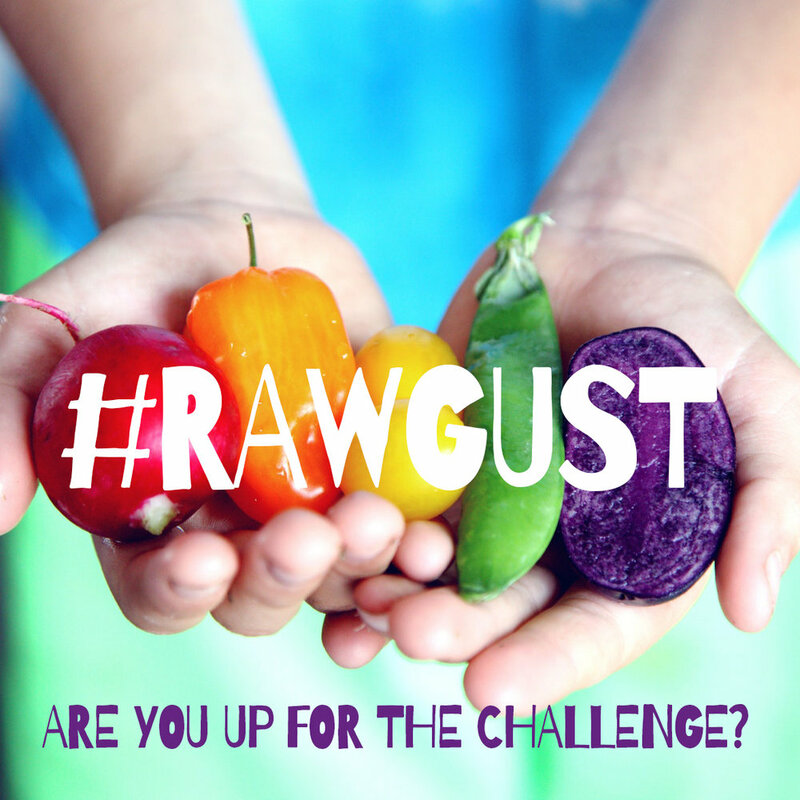 Still a few more days of #Rawgust to go, so I will see what creations catch my eye- I will be back with more raw recipes here soon! 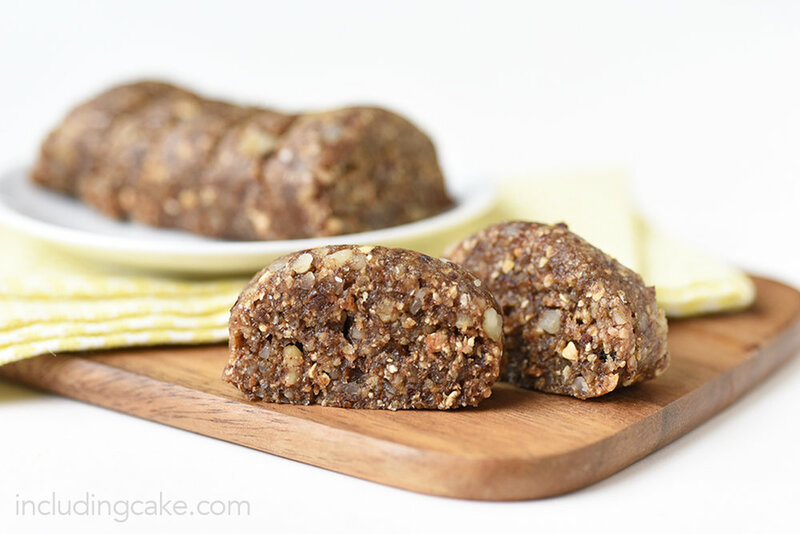 For now, I'll leave you with this recipe for a raw banana bread... I totally made this up as I went along, but it worked so well as a spin-off on a bliss ball style creation. * I loved the flavour and texture of the chunky macadamia pieces, but I imagine cashews or almond would also work well. Any ground nut could be used. If you want a more intense 'double banana' flavour, try using dried banana pieces (not banana chips) instead of dates - or half and half. 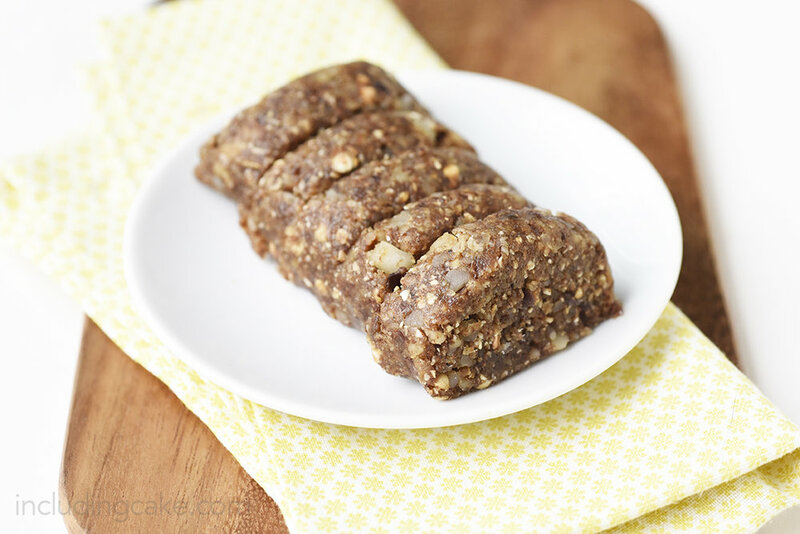 Blend the banana with the flax, cinnamon and dates until smooth. Add all remaining ingredients and mix well to form a stiff slightly sticky 'dough'. (I pulsed the mix together in a food processor but you could do it by hand). Form into a log on a liner and chill for at least an hour to firm up. Once firm slice into pieces and serve. Store in the fridge for up to a week. This freezes well too. 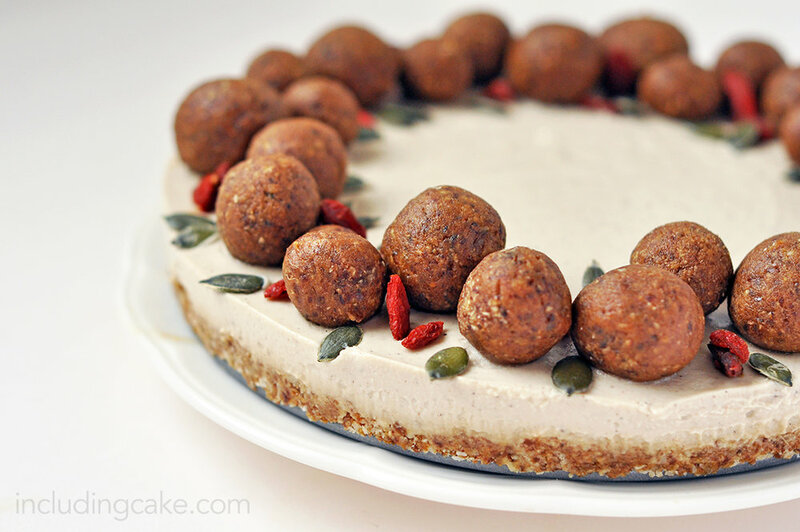 For more no-bake treats... gave a browse of these! I have made variations on it - these sweet potato rostis in particular, so I knew the rough idea. I figured I'd have to wing it and hope for the best.... it turned out really well! Instead of making it as squares as per the original photos, I cooked it in a square oven dish and served it up hot with a huge salad. The squares are still amazing though. This is best made with spiralized veggies for a pretty ‘curly whirly’ effect but you could use a julienne peeler or a coarse grater. I used a mix of carrot, courgette and a little onion but you could use fewer or different ingredients such a sweet potato or parsnip if you prefer. You could also bake this mix into pre-portioned muffin cups. To save time I used bought free-from pesto in a jar, but you could make your own, or use hummus with herbs added to it. Spiralize or julienne the veggies, chop a little to avoid very long ribbons. Set aside. Mix together the wet ingredients and add to the coat the veggies (taste test and add salt and pepper as desired). Add the gram flour last and mix to coat well. Add an extra splash of water if the mix doesn’t appear quite wet enough to coat evenly. Mix through the pine nuts now or set aside to press into the top if preferred. Press the mix firmly into a lightly greased brownie sized tin- the mix should be approx 2cm thick. Smooth the top and press in the pine nuts. Bake at 180C for approx 25-30 mins until golden. Serve hot or allow to cool and cut into squares- great for lunchboxes or picnics when served cold. Will keep in the fridge for a couple of days. Healthy Pimms... with a quirky ingredient! Drink Up Challenge.... swap out the sugar! 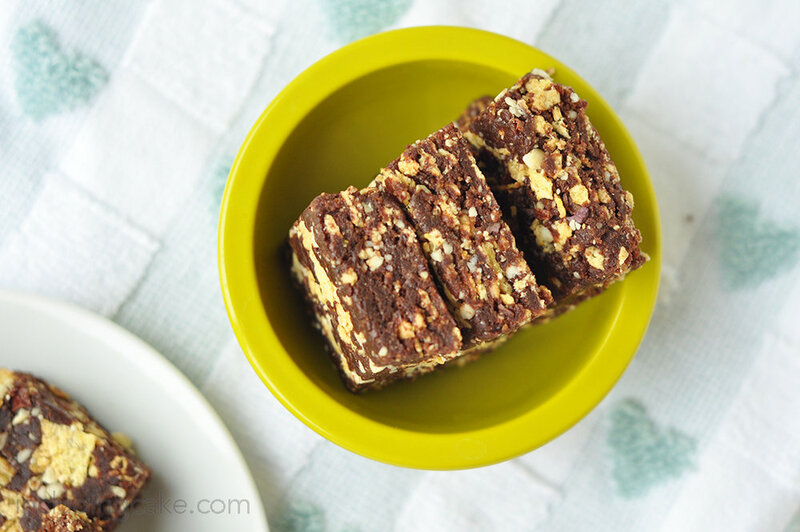 I first made this oat crumble recipe for my 'Not Just For Goldilocks' book, so I won't share it in full right here, BUT I will share with you a great spin-off in the form of these bars. I made the bars in the photos below initially for Real Food Source last year and using the same principle as the crumble I made them again. These bars are quite soft and cakey with a crisp top, which is how I love them. I used a combination of oats, ground almonds and tiger nut flour for the topping, but other flours in place of tiger nuts and almonds would also work. They also have a great nutritional boost by way of chia seeds which are also used here to thicken and bind the base and fruit layer. These are perfect served hot with some vegan for a little indulgence or with a dollop of plain vegan yoghurt for a breakfast option. Mix the oats, ground almond and tiger nut flour dried with the melted coconut oil and syrup. Set aside approx. 1/4 of this mixture for the topping (or more for a thicker topping). To the remaining mix, add the chia ‘gel’ to help bind. Press the crumble mix firmly into an 8” square pan- it should be approx 1cm deep. Bake for approx 15 minutes at 180C until just golden. Meahwhile stew the fruit in a saucepan, adding a little syrup to taste as the rhubarb and raspberries are tart. No extra liquid is required as the fruit will release it's own. Add the chia seeds during the last few minutes to help thicken. 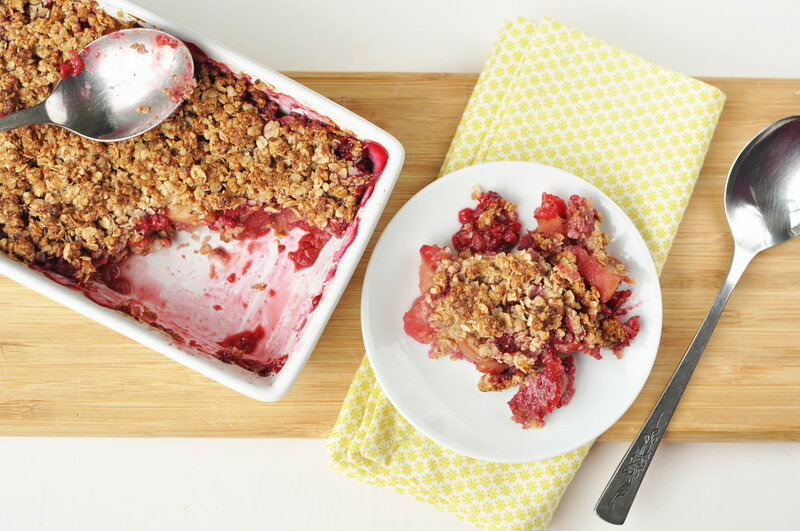 Remove the base crumble from the oven and spread the fruit layer evenly over the top. Add the reserved crumble mix, plus extra chunky nuts if desired. Bake for another 5 minutes or so until the topping is golden and the fruit bubbling. For more 'bressert' recipes... check these out! My favourites are courgette, carrot or sweet potato very finely grated and cooked in with the oats. There are loads (56 in total) porridge recipes and spin-offs in this recipe book I created in case you are interested! These photos also give a shout out to the book 'Thresholds' that I was featured in and have just had the hard copy delivered. Holding it in my hands was such a wondrous feeling. I contributed my story which tells of the most significant time of my life to date, I would love you to read it (it's in Kindle for only £1.49)... you can find more info here! Large handful of small dried fruit pieces- such as chopped dates, raisins, cranberries, mulberries or my Wholeplus Toppers (see note above). approx 1.5 cups non-dairy milk of choice - more or less for desired thickness as it cooks. Finely grate the courgette and add along with all ingredients (other than toppings) to a medium pan on the stove top. Bring to a simmer and cook for approx 5 minutes, adding extra liquid as required for desired consistency. In the second two photos I added turmeric and black pepper then added 1/4 cup almond flour and 1/4 cup teff flour with a dusting of cinnamon on top.